YN128 is a new portable beautify LED light specially designed for live video and selfie. YN128 adopts annular appearance design. For positive fill-in light is softer and much uniform, a perfect shot of catch-lights can be achieved. YN128 has three charging methods to meet different requirements in different scenarios: phone charger, portable power bank and computer USB port. With a hose support which can be adjusted to any angles, you can take photos or live video according to practical needs. For live video and selfie, lighting effect is crucial! The lighting effect of YN128 LED light source is soft and smooth; its TLCI and CRI are beyond 95. Therefore, with YN128, in the camera the skin is natural white, the facial contour is stereo, and, the video quality and photo quality are exquisite and perfect. YN128 adopts hose support which can be adjusted to any angle. By filling light omni-directionally, you always can find an angle appropriate. YN128 can be charged by phone charger, portable power bank or computer USB3.0 port. *YN128 adopts YONGNUO proprietary LED driving technology, its power output is stable and shooting effect is more reliable. With this YONGNUO proprietary LED driving technology, corrugation and stroboscopic flash can be effectively avoided. 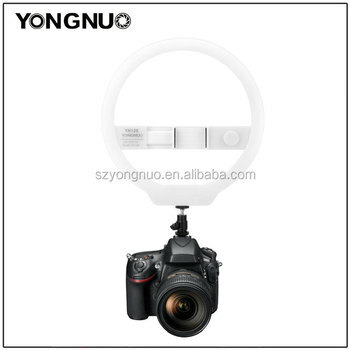 *YN128 can be connected to tripod mount and used on various occasions. By using stable base, you can use it on the desktop or other platform.